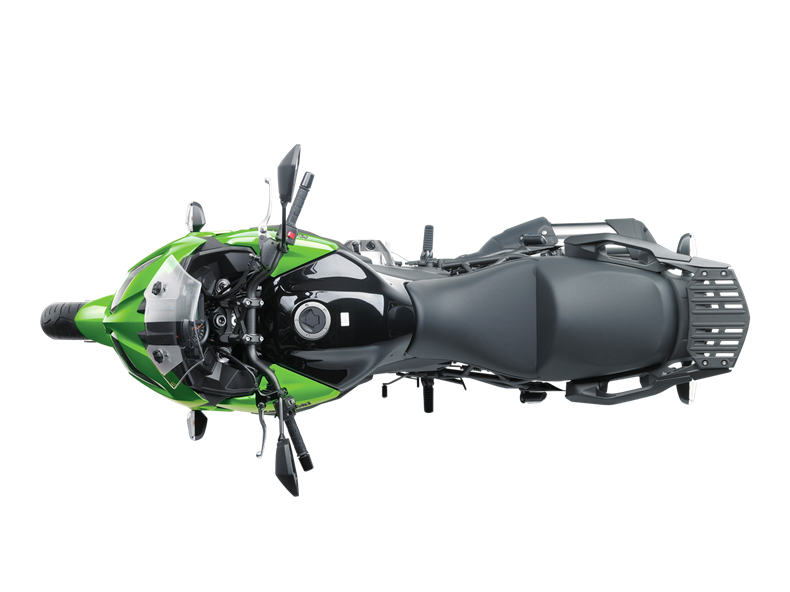 Robust trellis-style rear frame is the key to the Versys 1000’s substantial payload, enabling riders to mount accessory panniers, a top case, or both. New inverted fork offers composed damping and excellent action in a variety of street riding situations. Reduced damping and revised top-out spring settings contribute to increased ride comfort. Lightweight 17” wheels front and back contribute to quick, sporty handling. New tyres contribute to enhanced road sports performance. An accessory top case (and mount) can be fitted. The top case is rated for 5 kg, and with its 47 litre volume is large enough to fit two fullface helmets (available as accessory). on one tank could be 400 km.21 litre capacity enables long range between fill-ups (Range would vary depending on riding speed and conditions). 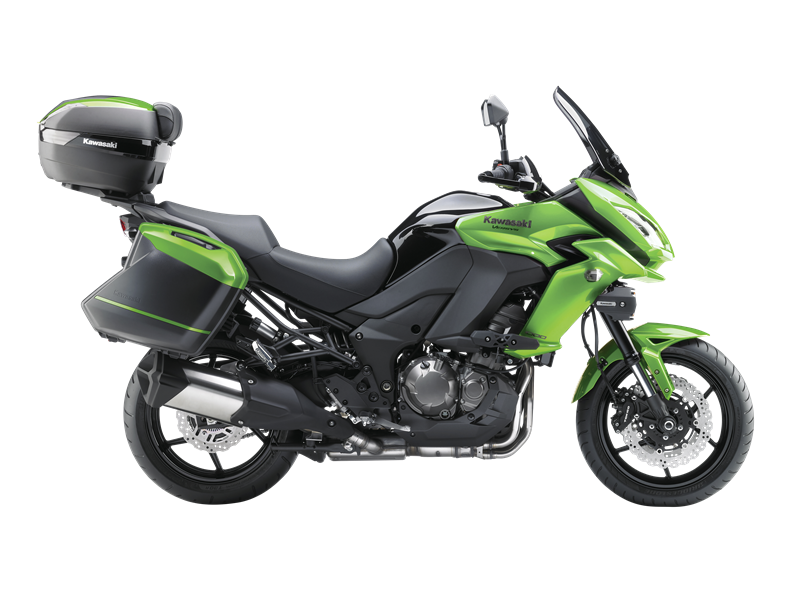 Complementing the colour-matched panniers and largervolume top case, numerous other accessories increase touring ability and contribute to long-distance comfort. Newly available accessories include a helmet lock, LED fog lamps and a gear position indicator. Wide handlebar offers easy control, especially for low-speed manoeuvring. Positioned to offer a natural grip, it allows the rider’s elbows to be slightly bent when sitting in a relaxed, upright stance. Stiffer rear shock spring (109 N/m) offers increased stability and more composed movement. 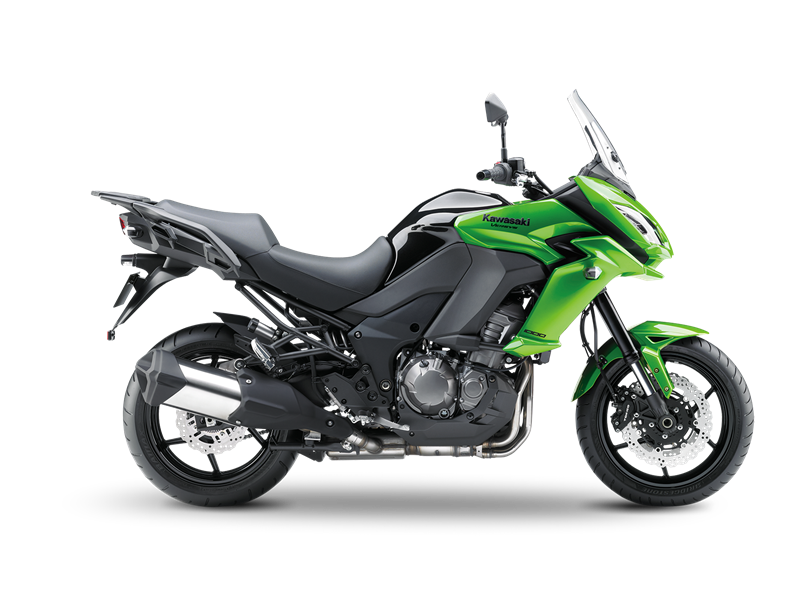 The stiffer spring also suits the Versys 1000’s increased curb mass. A remote preload adjuster means changes to suit tandem riding or luggage can be made quickly and easily by hand. The rear shock is also adjustable for rebound damping. Larger front discs are complemented by new pad material designed to deliver stronger initial bite. ABS – standard on all models – offers additional reassurance when braking on low-grip or uneven surfaces. Revised mounting system for the accessory panniers gives them a more integrated look, and ensures the rear of the bike looks sharp when the panniers are removed (Available as accessory).